The city of St. Louis is best known as the "Gateway to the West" because it was the starting point for the westward movement of settlers in the United States during the 1800s. Symbolic of the city's nickname, the Gateway Arch was built in the mid '60s. At 630 feet, it remains the tallest monument built in the United States, and it continues to remind us of those trailblazers from the past and the journey they chose to make. St. Louis was the last big city that many settlers encountered in which they could load up on supplies before venturing further west. It became a traveling hub for the various settlers, hunters and others migrating to the West. In fact, many entrepreneurs made their fortunes in St. Louis by selling products to the people heading west. Like those westward settlers, modern homeowners are exploring new horizons — not on any trail but within their homes instead. With an average home value of $96,000, it's a buyer's market in the St. Louis metro area, meaning that it typically takes homes longer to sell because buyers have the bargaining power, according to Zillow. Therefore, many St. Louis homeowners are staying put and enhancing their lifestyles with home improvements. 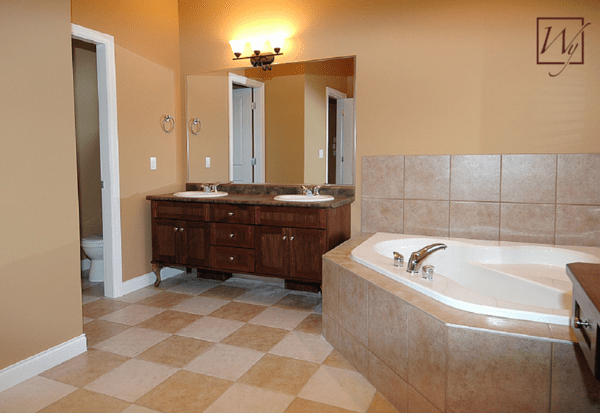 One popular way to upgrade a home is by updating the bathroom. When replacing the bathroom floor with new tile or stone, it's the perfect time to add radiant floor heating. Homeowners will especially enjoy this upgrade during those cold St. Louis winters. In order to get the best return on investment, homeowners will want to keep their renovation costs as low as possible. Luckily, adding electric floor heating to an average-sized bathroom is budget friendly! This St. Louis homeowner installed a 1.5- by 27-foot TempZone™ Flex Roll in their 93-square-foot bathroom (see floor plan) for under $500. The roll cost exactly $486, which comes out to just $12 per square foot. The roll was cut, turned and free-formed to fill 40.5 feet of available floor space with 15 watts per square foot of radiant heat. Of course, the cost of the material isn't the only thing that should be kept low. The cost to operate the system should also be taken into consideration. 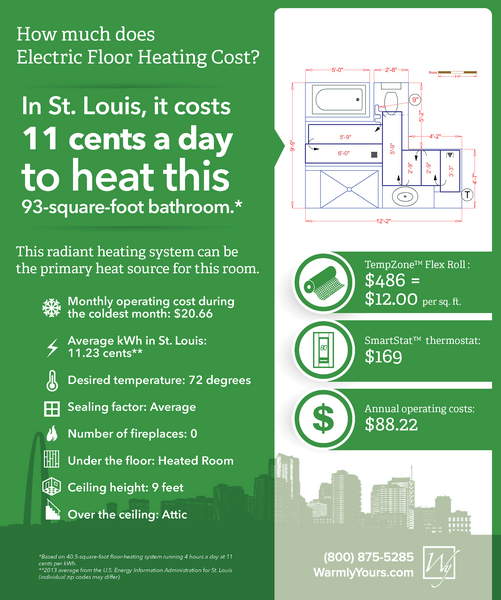 To heat this bathroom for four hours a day, it only costs 11 cents a day, according to WarmlyYours' Energy Use Calculator. Furthermore, it only costs about $20 to heat the room during the coldest month of the year, according to WarmlyYours' Heat Loss Calculator. For the entire year, it costs $88.22 to operate the system. The Heat Loss Calculator considers the desired room temperature, sealing factor, surrounding rooms and insulation factors to estimate whether radiant heat can be the sole source of heat in a room and how much it will cost to operate. Like the city of St. Louis, in-floor heating can be a gateway as well. Most of the time, once a homeowner experiences radiant heating, they can't go back to living without it. Instead, they're more apt to expanding in-floor heating to many other rooms within their home and even in different formats! For instance, a bathroom can make use of radiant heated floors as well as towel warmers and mirror defoggers. WarmlyYours offers a range of seven different towel warmers to suit any bathroom's style. We also sell various mirror defogger sizes that simply adhere to the back of a mirror to ensure a fog-free appearance at all times. For more information about the various radiant heating solutions that WarmlyYours has to offer, please visit www.warmlyyours.com. You can also get a floor-heating quote online using our Instant Quote tool. By entering information about your project, the tool will tell you what products are recommended for your room and how much they cost. To get a custom installation plan for your space, you can also submit a floor plan online or send it to your account manager via email (sales@warmlyyours.com) or fax (800-408-1100). Getting a SmartPlan™ installation plan will make sure you have all the information you need to get your project started, so be sure to start smart! Plus, if you plan to install your in-floor heating system yourself, you can feel free to give our technical experts a call with any questions. Our experts are available 24/7 at 800-875-5285 to assist you.